VILLAS AND APARTMENTS TO RENT IN TODI, ITALY. Welcome to our selection of holiday homes to rent in Todi, Italy. Todi is a town in the province of Perugia, which is located in the central region of Italy, known as Umbria. It sits on a double crested hill that overlooks the River Tiber and has stunning views in all directions. Most of the medieval buildings are located on or around the town�s main square, which itself has been used a number of times on different movie sets. The area as a whole is situated over an array of ancient Roman cisterns, of which 500 pits still remain to this very day. The cathedral of Todi dates back to the 11th century, it has a Gothic style to it and it is said to have been built over an ancient Roman building, which is rumoured to be the Temple of Apollo. The building had to have extensive work done on it after a fire in 1190; inside there is the Universal Judgement by Ferra� Faenzone and the 13th century piece of art known as the Crucifixion. Also located on the main square is the Palazzo del Popolo, or Peoples Palace, which is one of the most ancient communal palaces in all of Italy. There are two impressive great halls: the Sala Grande Inferior or Sala delle Pietre and the Sala Grande Superiore, which houses the town�s art gallery. There are two other main buildings located on the main square, these are the Palazzo del Capitano, or Captain�s Palace and the Palazzo dei Priori, also known as the Prior�s Palace. The Captain�s Palace is in an Italian Gothic style and dates back to 1293; the lower half of the building is home to the town�s museum. The Prior�s Palace is on the south side of the square and faces the cathedral; construction started in 1293 but it was later expanded and the exterior has a fabulous bronze eagle, which was created by Giovanni di Giliaccio. Worth visiting are the ruins of the Rocca, which was a medieval fortress; San Fortunato is a 7th century temple, which has two lion sculptures at the main entrance. The town has three sets of walls around it, the outermost wall is medieval in date, the middle wall dates back to Roman times and the innermost wall is Etruscan. There is also the Roman structure called Nicchioni, which nobody seems to know what its purpose was and a Roman Amphitheatre, as well as a number of smaller churches. 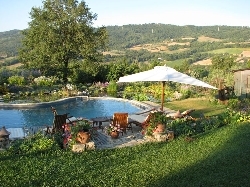 Looking for self catering holiday accommodation in Todi? Then below is a selection of Apartments in Todi and villas in Todi that can be rented direct from their owners. You can either click on each listing for further details or you can use our search engine on the left if you are looking for something in particular.